Who is the Goethe-Test PRO for? primarily use the Goethe-Test PRO in a human resources context for the assessment of German language skills of job applicants and existing staff. Additionally, it is increasingly being used for the monitoring and support of language training in companies. For example, it may be used to track language gain over an extended training period. 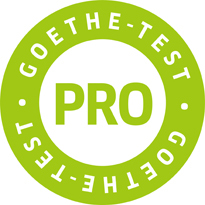 Companies and organisations also use the Goethe-Test PRO for benchmarking purposes, setting linguistic goals and assessing employees’ achievements against these criteria. predominantly use Goethe-Test PRO for course placement purposes, general language assessment as well as for recommendations to students in regard to the preparation for standard exams that lead to a certificated German language qualification. can make use of the Goethe-Test PRO in a number of ways. On the one hand, they can use the Goethe-Test PRO as an indicator of German language ability in a CV. Alternatively, individuals can use the Goethe-Test PRO to confirm the assessment of a standard certificate (e.g. Goethe Zertifikat: B1) which may have been obtained sometime in the past. It can also serve as a recommendation to an individual as to which standard exam he or she should prepare for. If you would like to take a Goethe-Test PRO please contact a Language Testing Competence Centre near you. Home - What is Goethe-Test PRO? Where can I take the Goethe-Test PRO?